I like Hong Kong Kai Lan (chinese kale). This vegetable is tender and crunchy to the bite and is not as “fibrous” as the usual Kai Lan. I do wonder whether these Hong Kong Kai Lan are genetically modified to its current size since it looks like a baby kai lan. Even the Hong Kong Choy Sum also tastes as good. 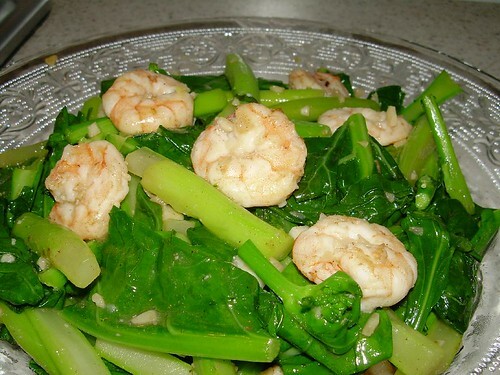 Anyway, one of the most common way of cooking this vegetable is to add fresh prawns into the dish. The prawns lend a sweetness to the dish and a contrasting texture as well. But really, even if you can’t get your hands on fresh prawns, you can also omit it altogether. Heat oil in wok and fry ginger till aromatic. Add garlic and prawns and stir fry till prawns begin to turn colour. Add kai lan stems. Stir fry for about 20 seconds. Add the kai lan leaves. Stir well and add seasoning. Add warm water and continue to stir fry till leaves turn dark green colour and limp. Add a little bit of corn starch if gravy too runny for your liking. Prawn shells can use to make a bit of prawn broth ya? You can use the broth instead of warm water to make the gravy. Har ? You called this baby ? I think it’s normal leh! Think your kai lan was cooked just right! I look at the color (still green…nice), and they look tender but firm (with crunch). Perfect! I find most green vege from Hongkong are smaller in size, crunchier & less fibrous. If only we can produce such quality locally, maybe they’ll be cheaper.